One benefit of computed tomography is that the workpiece is captured completely, including undercuts and internal geometries. Historically, computed tomography has been too slow for measurements during the manufacturing process. For years, real-time reconstruction in WinWerth® in parallel with image capture has been used to minimize measurement time. To move beyond this, several methods have been introduced, each with its drawback. For instance, the power level of the X-ray tubes may be increased, but this comes at a cost of lower resolution due to the larger focal spot. The exposure time can also be decreased by reducing the distance between the X-Ray source and the detector. However, doing this will increase the severity of cone beam artifacts. Directly reducing only the exposure time means that the dynamic range of the detector will not be fully utilized. Finally, it is possible to improve measurement time for a multicavity measurement, by measuring several workpieces simultaneously. This can be done because the point clouds are separated automatically. This method, however, generally limits the magnification, reducing the resolution for each individual part. The new OnTheFly CT (patent pending) saves time lag due to start-stop positioning of the workpiece by continuously rotating the machine axis. In conventional start-stop operation, the rotary motion is interrupted in order to capture each radiographic image, so that no motion blur occurs under continuous exposure. For OnTheFly CT, short exposure times are needed in order to minimize motion blur. To achieve the same measurement uncertainty as in start-stop operation, the number of rotary increments is increased. The specification according to VDI/VDE is not affected, despite the greatly accelerated measurement process; ensuring traceability of the measurement results with OnTheFly CT is maintained. 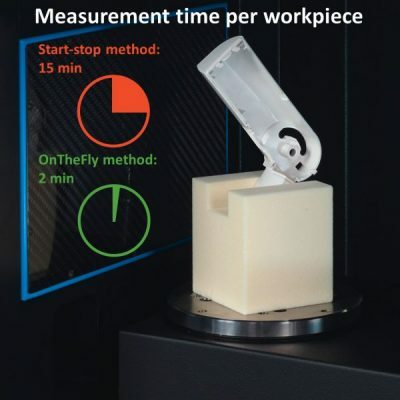 With the new OnTheFly process, measurement time can be reduced by up to ten times for the same quality of data. The workpiece volume is reconstructed in real time and is available immediately after measurement. Alternatively, the data quality may be increased for the same measurement time. Methods such as raster and ROI (Region of Interest) tomography or higher detector resolution produce workpiece volumes of higher resolution with a better signal-to-noise ratio. The increased measurement time traditionally associated with these methods can be avoided with OnTheFly CT. The new technology opens up further areas of application for computed tomography that have strict measurement time requirements for a given data quality.